These days, shops selling artists’ materials sell many different types of oil paint: from very inexpensive to extremely expensive. What is the difference between all these paints? And which one suits you best? Oil paint is made from a pigment, a binder (oil) and sometimes fillers (chalk etc.). The paint’s quality and price depend on the quantity and quality of these ingredients. In general, we differentiate between the paint qualities given below. The best type of oil paint is the classic oil paint. For this the best pigments and binders for raw materials are used. There is a very large pigment content. This oil paint is very well dispersed. This creamy paint is a bit viscous and so it is stiffer to apply, but it gives the maximum colour strength, because no cheap fillers have been added. Nearly all the pigments used for classic oil paint are lightfast. 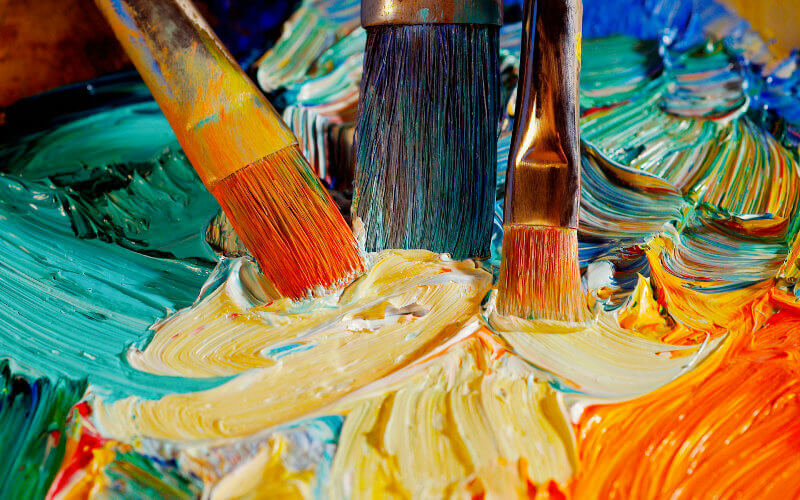 Professional artists usually use these paints when setting the highest demands for a painting. Both the fine and the extra fine oil paints contain only good pigments, but they are each less concentrated. Proportionately less pigment is used in comparison with the classic oil paint. These paints are suitable for artists who seek a reasonable price-quality ratio. Study oil paint sometimes only contains 3% pigment and 97% cheap chalk or some other filler, which explains why this paint is so low-priced. This inexpensive paint type often bears the name of expensive pigments, such as cadmium and cobalt, but with the word imitation added. This indicates the use of a cheaper pigment in the manufacture to imitate colour shades. Often, the inexpensive study oil paint contains no good lightfast pigment and is the least concentrated. This paint is suitable for artists, hobbyists or starting artists, whose work does not demand high artistic quality. These are the most inexpensive paints of all. Paintings made using these paints have a limited life span and are extremely vulnerable.